Ahoy there me hearties! It’s me again yer favorite app pirate back from our adventure from Davey Jones’ locker. Ye know how we get so excited on the dangers that lies ahead and we never back down from them, aye? Well, every dive is all worth it because we always find amazing treasures! ‘Afore I go on another dive, let me first make an app review that me know ye buckos are waiting for. The app that is up for review today is called Potion Punch by Monstronauts Inc. Avast ye and let’s start! Whether you have played diner games before or have heard of it, you would know that you would play as the restaurant staff serving the customers. It’s exactly how this one works, but instead of a restaurant, you will be working at a potion shop. 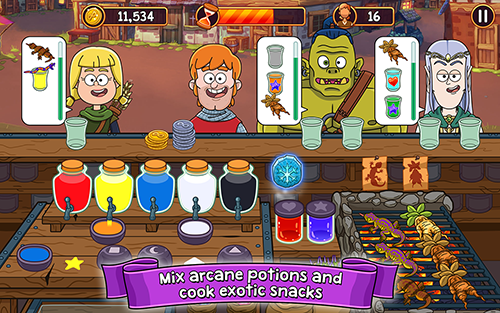 You will be serving potions and other weird items like grilled gecko to the customers. Every level has a specific goal that you need to achieve within a specific period. The containers take some seconds to fill, which could have been made a little quicker, as you are also in a time crunch. 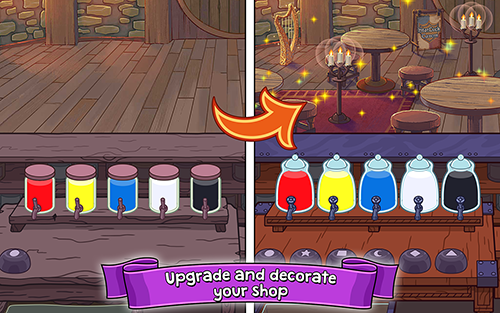 The introductory story gives you a background on what happened to the owner of the potion shop and why you are there to serve the customers. Not all games have a backstory, and this app having one is an additional point. It gives you that different level of playing when you know the story behind it. The developers did an awesome job with the graphics. The overall setting feels medieval. The old man who owns the shop transformed into gnome after drinking a potion. The character that you will be playing helped the old man in running the potion shop. There are various customers that include a rangers and a knight. The game is fun because of the adorable graphics that are nice to look at. It’s also challenging because you only have a limited time to achieve the mission for the level. Failing to complete mission will not let you move to the next one. There are also upgrades that you can make in order to earn more. However, these upgrades could cost more gold and gems in the long run, thus making it more difficult for the shop to grown, when you reach higher levels. Potion Punch is free to play. It’s familiar because it has the same basic gameplay as diner games, but it also has a fresh take because it is set in a different period, and instead of food, you are serving potions. It’s enjoyable to play and also challenging. The upgrades can cost a lot of gold and gems in the higher levels. Potion Punch is recommended for those who are looking for casual, serving game that’s fun and challenging. The upgrades may cost a lot of gold and gems in the long run, but the game can still be enjoyed even while waiting for you to afford the upgrades.